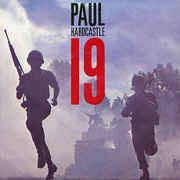 “19” by Paul Hardcastle is a track that everybody who was around in the 1980’s must surely recognise and remember. It was released in 1985 and took the UK chart by storm, staying at number one for 5 weeks. It also enjoyed a stint at the top of the charts in many other countries including Austria, Germany, Italy and New Zealand, and more besides. The track consisted of a dance music backing which was overlaid with vocals provided by Peter Thomas, an American narrator of documentary TV shows. The vocals were in fact exactly that, the narration of a TV show about America’s involvement in the Vietnam War, with a little electronic trickery applied to them. Thomas’ voice was sampled and played back in different ways by a synthesiser, allowing for words to change in pitch or have parts repeated, creating a kind of stuttering effect. How many of us have attempting to sing along by going N-n-n-nineteen I wonder. Whilst Peter Thomas was initially against the song he relented and allowed it to be released, and just as well as not only was it a great song, it was also educational! Many people of my generation had heard of the Vietnam War, but didn’t really know much about it, especially those of us from Europe. The song does a good job of letting us know about the atrocities of that war, with the title, “19” coming from the average age of the soldiers that fought in Vietnam, which contrasts sharply to the average age of a World War II soldier, which was 26. The song was accompanied by a video which used stock clips from the period to really highlight the message of the lyrics, and you can view it at the end of this post. 19 was not Paul Hardcastle’s only hit however, although it was certainly his biggest. He also created a track called The Wizard, which if you ever watched Top of the Pops in the 1980’s you will have heard, as it was used as the theme song. The song also has the rather dubious honour of inspiring the comedy song N-n-n-nineteen Not Out, a song about the state of English Cricket at the time by impressionist Rory Bremner. This entry is filed under Music - Songs	and was posted on March 6th, 2009. You can follow any responses to this entry through the RSS 2.0 feed. You can leave a response, or trackback from your own site. 1985 wasn’t a bad year for the England Cricket team though ! Away win in India (no mean feat) followed by an Ashes win at home. Very odd, how it captured our imaginations. My only knowledge of Vietnam was vague memories of M.A.S.H. on TV back when I was very young. It caused an explosion of interest among my peers (not with me though) they got books on it, and films. They played it at a nightclub I was at last year, and everyone went berserk for it! Likewise SinceYesterday, I remember a lot of my mates raving about films like Platoon and Apocalypse Now, but I never really saw the appeal myself. 19 however is a classic, and introduced me to the fact that there had been further wars in the world since World War II, something I’d never realised until it hit the charts.